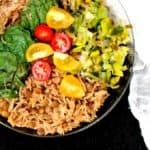 This one pot mujadara with leeks and greens checks all boxes: it has the healthy goodness of lentils, rice, and beans, it is a mess-free recipe that comes together in minutes, and it is absolutely delicious. Vegan, soy-free, gluten-free, and nut-free. 4 cups leafy greens(use any combination of vegetables. I used 3 cups of spring greens and 1 cup of baby spinach). You can chop larger leaves into smaller bits.